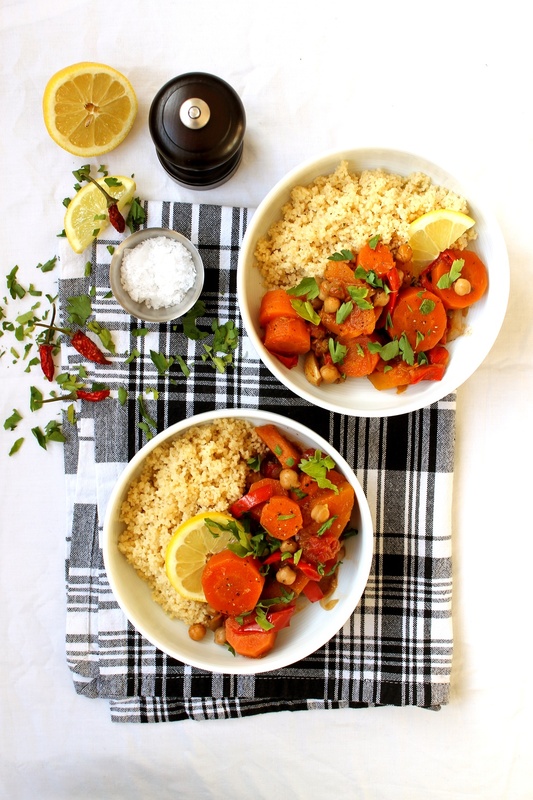 Warming, filling and just so cosy, this vegan Moroccan tagine is the ideal dish to meal-prep to cheer you up for the whole week ahead! In a large pot, heat up the olive oil. Add the onion and spices and cook until softened and translucent. Add the red pepper and cook until soft. Add the carrots, butternut squash and chickpeas, season with salt and pepper and cook for 5 min or until lightly roasted. Add the chopped tomato, stock cube and water (enough to just about cover the vegetables). Pop the lid on the pot and cook for 20 min on low heat. Transfer to a serving dish, sprinkle with chopped parsley and serve alongside couscous or quinoa and slices of lemons.